All of these first round upsets have been great for our draft position. Thanks Mister Game 7.
uuuuh this sounds a lotttt like Andy Murray's "I play my best hockey when_____" elementary school assignment he made his players do. I've honestly never been overly impressed with Kempe. Is a pink jersey a thing? Has that ever been a thing? Only series i gt right was Boston in 7 and Sharks winning, but in 6 games. What an amazing first round. I am not light hearted. If any of you make me mad, I'll go Ovi on you all!! :Dancing_mad: Haha. Wolverine hair!! 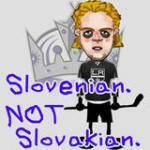 When he was with the Kings, I always referred to him as "Mr. Dependable" He has never given me a reason to not call him that. Just love the guy. Remember when everyone was up in arms because the Kings traded Fasching, the future NHL star? Agreed and Agreed. I hope GBS has some magic to teach the team before Sunday on how to provide some finish in the final third of the area.